Atos, a global leader in digital transformation, together with Worldline, European leader in the payments and transactional services industry, highlights in its new Digital Vision for Financial Services opinion paper how a revolution in digital payments and transactions will dramatically change our relationship with money and all traditional financial organisations and new entrants into the market. The shift from physical money to digital transactions when combined with new regulation and emerging technologies is creating an environment of radical change across the sector. Further profound implications are expected for traditional insurance structures for example, as Internet of Things and data utilisation methods lead to traditional policies disappearing to be replaced by ones based on real-time and personalised data. From more agility and innovation by incumbent operators to innovating at scale by smaller FinTechs, experts argue the full spectrum of Financial Services organisations must fully embrace the challenges, but also the opportunities of Open Banking, General Data Protection Regulation (GDPR) and emerging technologies. 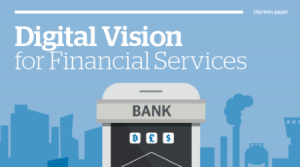 Presented by some of the leading subject matter experts within Atos and Worldline and across the sector including Salesforce, Microsoft and Dell EMC, Digital Vision for Financial Services positions the current age of digital transformation as arguably the most critical period in Financial Services history. Peter Roe, Research Director, Financial Services, TechMarketView LLP, said: ”As Financial Services providers look at the vast array of new technologies at their disposal, they need to consider carefully how they and their suppliers can realise the potential benefits of digital as they modernise their business processes. “This requires that each party fully understands the specific business processes, the risks inherent in change and the wider implications for organisational culture and behaviours,” added Peter. This is the seventh paper in the Digital Vision programme and comes after Atos recently announced a multi-year contract with Aviva to deliver data services as part of its digital transformation programme. Atos was recognised as a Major Contender in Digital Services for Consumer Banking by Everest Group. Worldline, an Atos Group subsidiary and the European leader in the payments and transactional services industry, was ranked in the IDC Financial Insights FinTech Rankings Top 100. Atos is a global leader in digital transformation with approximately 100,000 employees in 73 countries and annual revenue of around € 13 billion. European number one in Big Data, Cybersecurity, High Performance Computing and Digital Workplace, the Group provides Cloud services, Infrastructure & Data Management, Business & Platform solutions, as well as transactional services through Worldline, the European leader in the payment industry. In the UK & Ireland around 10,000 employees deliver business technology solutions for some of the country’s largest public and private sector organisations. With its cutting-edge technologies, digital expertise and industry knowledge, Atos supports the digital transformation of its clients across various business sectors: Defense, Financial Services, Health, Manufacturing, Media, Energy & Utilities, Public sector, Retail, Telecommunications and Transportation. The Group is the Worldwide Information Technology Partner for the Olympic & Paralympic Games and operates under the brands Atos, Atos Consulting, Atos Worldgrid, Bull, Canopy, Unify and Worldline. Atos SE (Societas Europaea) is listed on the CAC40 Paris stock index.